Tablet production went through a bit of a lull with the rise of phablets, but we’ve seen some excellent devices roll out in the last few years. If you’re looking for the best Android tablet, you’ve come to the right place as our experts put together a tablet buying guide along with a quick list featuring some of the top models around. One of the cool things about Android devices is the fact they come in all shapes and sizes. Well, today we aren’t going to go into detail on design or jump into the Android vs. Windows tablets debate. Instead, we are going to focus on four key areas with the display, horsepower, battery life and extra features. Do you need a large 10-inch slate or are you looking for something closer to a phablet in size? The world is your oyster when you’re shopping for an Android tablet. They generally range from around 7 to well over 20-inches depending on your needs and budget. Every mobile tablet has a touchscreen, so pay attention to the resolution and color depth if you watch a lot of media. On the high end, you’ll find tablets with QHD and UHD displays while budget-friendly options are generally either 720p or 1,920 x 1,080, otherwise known as FHD. If you only plan on using your slate to browse the web or play casual games, you’ll be pleased with an FHD display and will appreciate the boost in battery life. On the flipside, gamers or designers that need the best will want a 2K display at a minimum. Whenever someone mentions power in the tablet world, they are referring to the processor and memory. It’s no different than checking specs for a desktop or portable 2-in-1 laptop as the larger the number, the better. With processors, the Snapdragon 800 series rules the roost although AMD chips and others still perform admirably. Qualcomm changes chip on a yearly basis, and so manufacturers. If you want the scoop on their latest chips, be sure to check this out. RAM or memory can range anywhere from 2GB to 4GB of RAM. We recommend the latter if you want full multitasking capabilities as it’s one area you can’t expand. There are a few tablets that offer 6GB, but those are still far and few between. While pixels and power are essential, battery life is arguably the first thing you should look for when choosing the best Android tablet to suit your needs. If you’re picking up a slate for work, you’ll want to look for a tablet with excellent battery life. Wall sockets can be hard to come by, and losing power halfway through the day is not ideal. The same goes for professionals or gamers. Some high-end Android games can drain your battery in an hour while others are optimized to get you through the day. Things like Wi-Fi, Bluetooth, and notifications can take a toll on your battery life as well. Want a tablet with a fingerprint scanner? That’s not a problem, and some will even scan your eyeballs. Those are what we call flagship features, and so are things like 4G LTE and AR-based setups. You’ll need to pay a premium for those features while others are quite common. Bluetooth and Wi-Fi are available on any tablet, and you can say the same for cameras. How good those sensors are is a different story, and it’s rare to find anything above 8MP on a slate. You can usually find an audio port although USB Type-C charging is still hit or miss. Samsung is the sacred cow of consumer electronics nowadays, and the Samsung Galaxy Tab S4 is the ultimate Android tablet, which is aimed at helping you become a true-blue South Korean robot in terms of productivity. Joke aside, the main attribute of the Galaxy Tab S4 is its versatility, i.e. this beast of a tablet can successfully replace your PC/laptop with ease, due to Samsung’s proprietary desktop-like Dex interface. Okay, at least that’s what the Korean tech giant was aiming for with this 10.5’’ S-Pen stylus included monster of a tablet. But how does the Galaxy Tab S4 perform in real life you asked? The answer is “next level Android tablet”, i.e. if you’re looking for laptop-like mobility and desktop-like power in one single gadget (okay, maybe we’re overreacting a little bit), it doesn’t get much better than the Samsung Galaxy Tab S4. Obviously, you’ll have to pay a hefty price for this baby, but you’ll get a lot of bang for the proverbial buck: resizable windows, a system tray, taskbar, along with high-end specs and a stellar 10.5’’ wide Super AMOLED display (Samsung’s specialty). And speaking of hardware, you’ll get a Qualcomm Snapdragon 845 system on chip, with 4 GB of RAM and 64 GB of internal storage, all backed up by a beefy 7300 mAh battery. On top of that, there’s a micro SD card expansion, and a 3.1 Type C USB port. Bottom line, if money is no object and you’re not an Apple fanboy (or girl), just go for it. Huawei devices were once hard to get ahold out outside of their homeland, but those days have changed. The company expanded their worldwide reach with several high-end mobiles including the Huawei MediaPad M5 tablet. The M5 comes in two different sizes with your choice of an 8.4” or 10.8” display. Both have the same type of display with a 2K Ultra Vision panel and sport a Kirin 960 processor with 4GB of RAM. They also have a 360-degree sound system so films and games will sound just as good as they look. The MediaPad M5 has more onboard storage than other models with 64GB to go along with features like a microSD card slot, a 13MP rear camera, 8MP front-facing camera, and quick charging. In addition to the regular M5, there is an M5 Pro which ups the ante with an active stylus and pressure sensitive display. That model is on par with the Tab S3 if you want a solid drawing tablet. Either way you go, this curved beauty is a looker and has enough pop to satisfy anyone’s needs. It also runs Android 8.0 out of the box and sports a 12-month warranty. ASUS is one of the more prolific tablet makers on our list. They have produced a continual stream of ZenPad’s over the years, and the 3S 10 caught our eye due to some interesting features and budget-friendly price tag. This is a 9.7” slate that’s also in the 2K class. The company used TruVivid tech to add some pop, and behind that glass, you’ll find a quad-core MediaTek chip clocked at 1.7GHz and a dual-core 2.1GHz Cortex processor. Those chips are backed by 4GB of RAM, and you’ll have 64GB of storage to work with initially. Other perks include a fingerprint scanner, a 2-in-1 headphone jack and a 5MP snapper for selfies. ASUS’s ZEN-based lineup may not be as popular as the Galaxy series, but what the ASUS ZenPad 3S 10 lacks in style, it makes up in features. It has all the bells & whistles you could as for even if the OS is extremely outdated with Android 6.0. 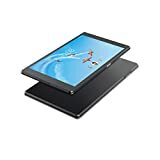 If you’re in the market for an affordable slate, Amazon has been a great way to go as they make one of the best 7-inch tablets. The Fire HD 10 is their largest, and arguably their most popular option yet. It’s also quite affordable in any configuration or color. While you won’t find a fingerprint scanner or 2K display on this one, the 10.1” FHD panel doesn’t disappoint. It has Alexa built-in and a 1.8GHz quad-core chip along with 2GB of RAM. The battery life is solid, but the cameras are lacking as there’s a 720p snapper on the front and a 2MP sensor on the rear. It’s ideal for media lovers and sturdy enough for children – just remember to lock those apps down. Amazon’s devices aren’t known for their groundbreaking features or speed, and you certainly won’t set any records with this one. 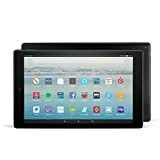 If you are an Amazon household or just need a cheap slate, you’ll be hard pressed to beat the Fire HD 10. 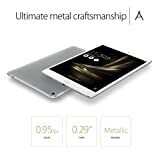 You can pick this tablet up with 32GB or 64GB of storage although both have microSD card slots. There are three colors available, and you can shave a few bucks off the price if you take the “special offers” approach. While it’s difficult to find good Android tablet under $100, the Lenovo Tab 4 comes close. The 8-inch variant of this slate is well worth a look if you’re budget is tight, and you stand to get by with a little less horsepower. The Lenovo Tab 4 is powered by a 1.4GHz quad-core chip and 2GB of RAM. While far from the flagship level, it will get the job done. The storage is disappointing however at only 16GB although expandable through a microSD slot. As for the display, it has a resolution of 1,280 x 800. One thing the Tab 4 has others tablets lack is a multi-account mode. This allows you to set up seven different accounts, each with their own settings. This 8-inch slate should be on your list if you need an affordable solution for the road or the kids. While we would have liked to have had a bit more RAM, you really can’t beat the price point, and you’re getting Android 7.1 out of the box to boot. 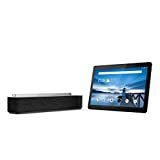 The Smart Tab M10 from Lenovo is designed to be an affordable entry-level tablet which runs on pure Android (almost), boasting a full HD 10.1’’ wide display and full Alexa compatibility. On top of that, you’ll get a Smart Dock (featuring 2 Dolby Atmos speakers) included in the retail package, along with 16 GB of internal storage, everything for under $200. Speaking of “make me an offer I can’t refuse”, this is as good as it gets. Hardware wise, the Smart Tab M10 is powered by a decent Qualcomm Snapdragon 450 system on chip, helped by 2 GB of RAM. We know, 2GB of RAM in the “current year” is not much, but considering the price tag, it’s not that bad either. When docked, the Smart Tab M10 transforms into a smart screen with Alexa, i.e. you’ll get your personal digital AI-enabled assistant at a flick of the switch or something along these lines. Alexa can be best described as a voice-enabled digital butler, and once turned on, it’s perfectly capable of playing videos for you, or to stream music, dim the lights, change room temperature and so on and so forth.